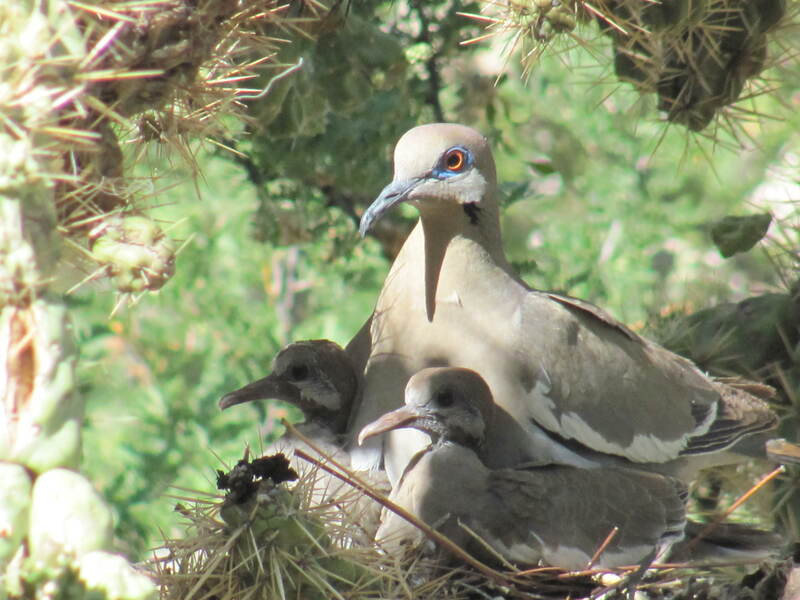 The blistering desert heat seems to act as an incubator for all the baby birds! 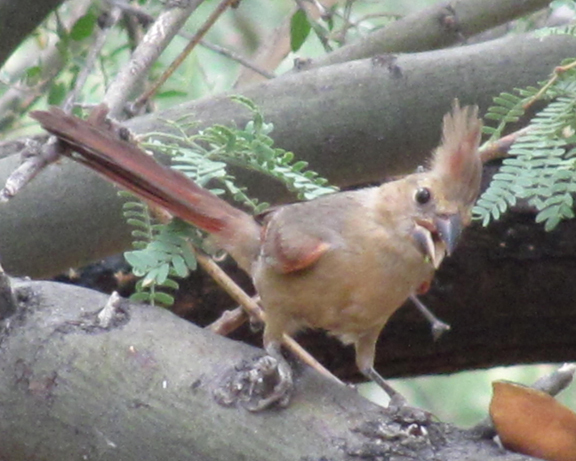 Everywhere we look, we can see full nests, or babies just leaving the nests. Baby doves wander up on the porch, seemingly tame. Probably because generations of their families have been born and raised just feet from where we humans hang out. The white wing doves seem to be the most prolific during the summer. They spend their summers here, just to have their babies, then they will leave and head further south for the winter. Todd caught this picture just the other day! 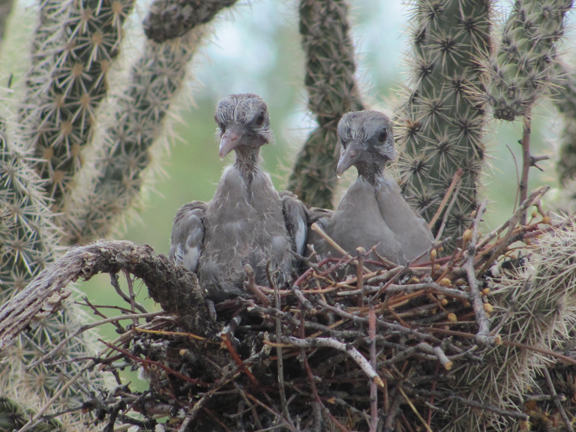 A pair of baby white wings….So ugly they’re cute! The baby quail are thick! They are born in ‘stages’…The first ‘stagers’ hatch in May, the second ” around the first of July, and the third will show up around the end of August. 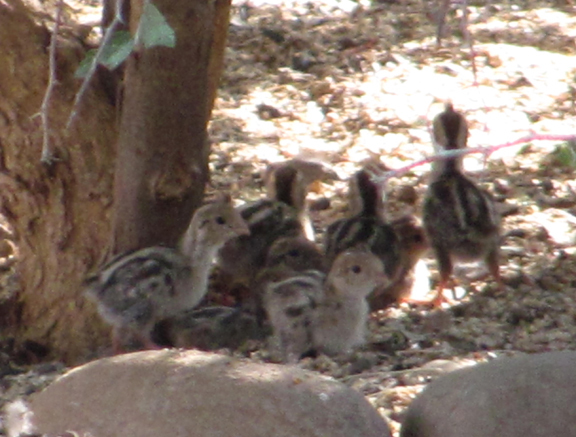 So this time of year, we have two varieties of baby quail. The ‘stripers’ tiny striped balls of fuzz. And the ‘juniors’, gangly and half-grown, still following their parents around the yard. The family of 27 hatchlings we had several weeks ago, are now a mini horde of ‘juniors’. Unfortunately no longer 27 strong, but there are still a good 15 or 16! So when we do see one, it’s a real ‘tweet’! As always and forever, Todd’s Backyard brings me joy and peace and memories I will hold forever! Thank you for being in my life and sharing these visions that make it always fresh and new.